The vibrant street culture and ubiquity of live music is an obvious first impression made on any visitor to Brazil. Samba on the sidewalks of Rio or capoeira in Salvador are common sights and sounds, and not just staged for the tourists: they have also formed a part of social life there for generations. Maracatu de baque solto (sometimes called “rural” maracatu) is less widely known, in part because it exists only in the coastal sugar-producing region of Pernambuco north of the city of Recife. Although it has a strong carnival tradition, its backbone is really the all-night performances that emphasize the poetic prowess of its singers through their mostly improvised verse. 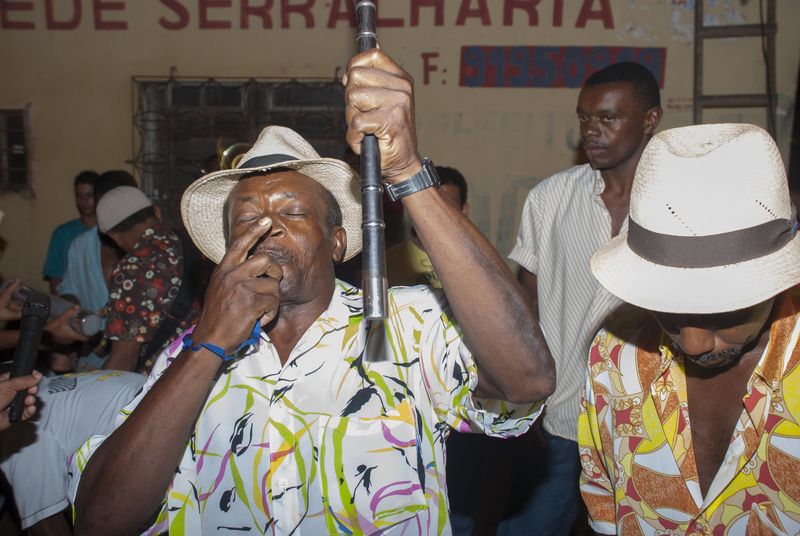 These events include the sambadas or contests of intense verbal sparring, a battle of wits and wordplay between two established singer-poets from different maracatu groups, as well as looser, more open “rehearsals” (or ensaios) held once or twice a year by a given group in the neighborhood they call home, when visiting singers are also called upon by the hosts to display their skill throughout the night. The instrumentation is made up of brass and percussion played at a breathtaking pace, but which careens to a halt every time the singer signals that he is ready to launch into complicated stanzas of a cappella sung verse, performed within a demanding structure of rhyme and meter for a discerning audience, fanatics attentive to every detail, ready to howl with derision if a singer slips up. A sambada contest traditionally ends only at the break of dawn, the first rays of the sun revealing which mestre has emerged victorious. 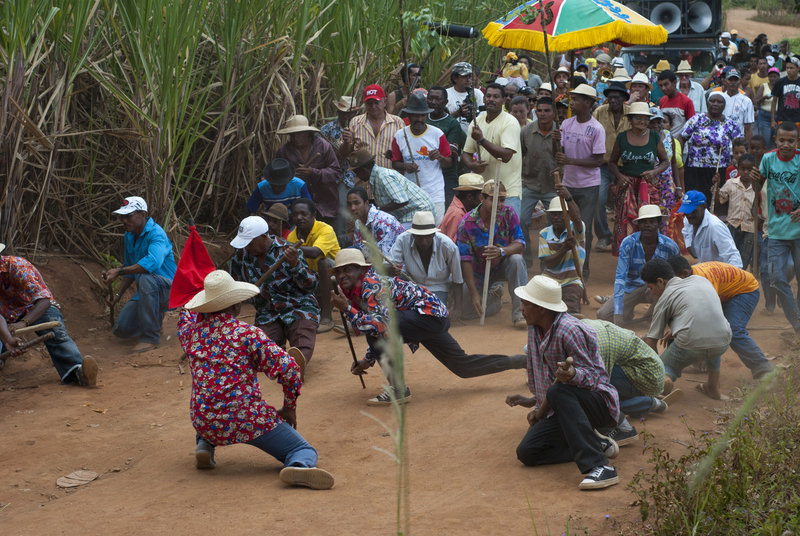 These unique events only occur on Saturday nights beginning in the traditional sugar harvest month of September and continue until carnival, at which point the groups take a long break before slowly beginning the cycle all over again. Relatively unknown outside its place of origin until the late 1980s, maracatu is now celebrated as a symbol of identity and cultural tradition in the state of Pernambuco. Yet as an art form associated with the rural poor and working class, it continues to develop in a liminal space of socioeconomic disparity and discrimination, even while receiving recognition and legitimation from other sectors of society. Nothing says this clearer than the current suppression of the ensaio and sambada tradition by the scattershot enforcement of new laws purporting to promote “public security,” allowing authorities to close down these events at 2 a.m. in the small towns and cities where maracatuzeiros have flourished for the last century. The rationale given for this recent persecution of maracatu is public safety and an arbitrary silence law. In the three years I spent attending maracatu events in the Mata Norte region, the number of violent altercations I witnessed can be counted on one hand. Maracatuzeiros, as maracatu enthusiasts are called, do everything they can to prevent a conflict from escalating into a fight. 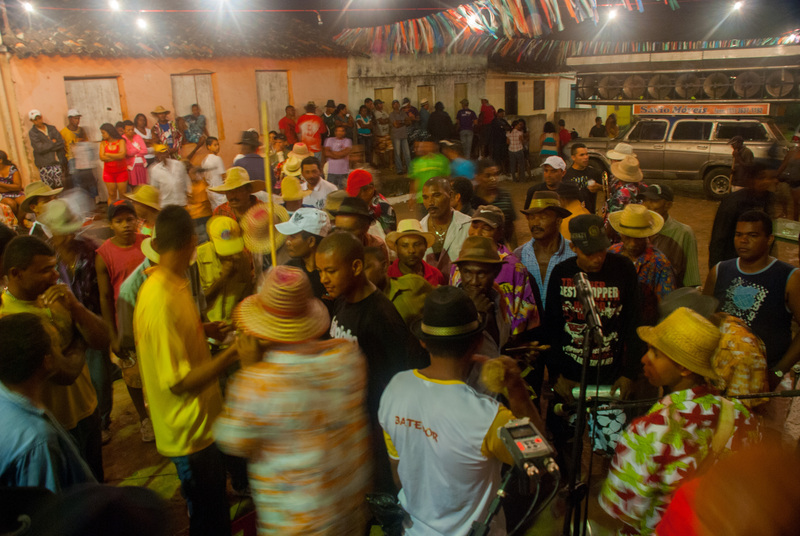 In fact there is no safer public place at 3 a.m. in the small towns than in the middle of a maracatu performance: this is a community that looks out for its own, polices itself, and treats visitors and outsiders with the same courtesy extended to houseguests. By forcing everything to end prematurely, people are left to their own luck as they make their way down poorly-lit streets in the middle of the night, easy prey for assaults. At the first ensaio that ended this way in Nazaré, I met a São Paulo tourist who ended up sleeping on the floor of the maracatu’s headquarters after the event was shut down at 2 a.m., because bus service back to Recife does not begin until 7. There are people who see a kind of romantic rebellion in maracatu. But a maracatuzeiro is in truth always making peaceable agreements. The maracatuzeiro is who waits for the evangelical church to finish services before they start their own party. They are the ones who cancel a rehearsal when someone in the neighborhood has recently died. Maracatu also has to reach agreements with the police. To hold even a small rehearsal, you have to prepare a document and go to the police headquarters of your city to inform them about the planning of the celebration and requesting police presence at the locale. 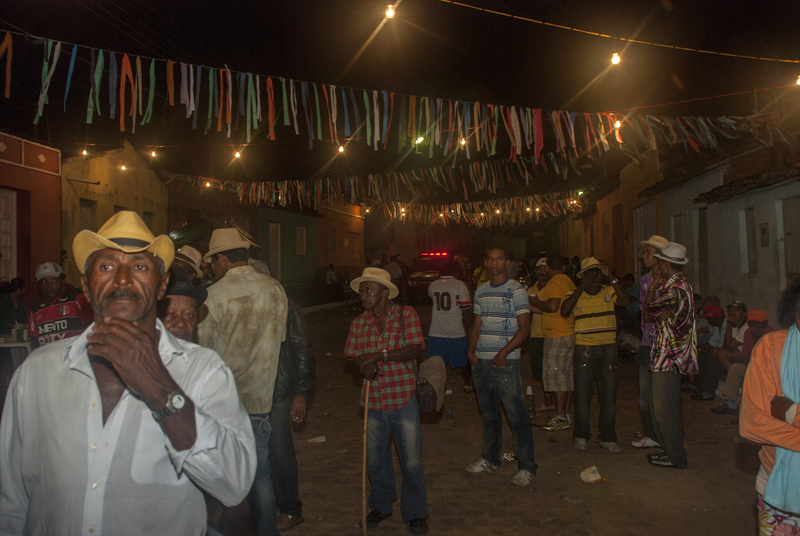 Police always appear at some point in the night, observing from afar, eventually making their rounds at the surrounding bars but never, never entering into the maracatu to interfere. In my years there I never witnessed a situation of tension between maracatus and the police. I always understood this as a good example of an agreement between power and local custom, but recently this reality has changed. Maracatus have been systematically impeded from realizing their rehearsals through the break of day. On the eleventh of January, I spent the better part of an ensaio with the group of which I am part, Maracatu Estrela Brilhante of Nazaré da Mata, arguing with the police about whether or not we had the right to continue with the celebration until morning, seeing as we had a document giving us authorization and they had a higher order to tell us to stop. Estrela Brilhante’s rehearsal was allowed to continue after this long negotiation, one that was no doubt influenced by Siba’s status not only as a nationally-known figure but also as a person of light skin and a member of Brazil’s artistic elite in an extremely class-conscious society. He notes that most of the other famous maracatus in the area have not been so lucky, and have had their rehearsals forcibly shut down. None of the older veterans of these maracatu groups, whose memories reach back to the 1960s, recall any similar prohibitions ever being imposed. Siba also notes that in contrast to these neighborhood events driven by the maracatuzeiros themselves, maracatu productions sponsored by the local mayors or by “cultural projects” with state or federal backing seem curiously immune to these silence laws, a phenomenon I also noted during my own fieldwork. When it is convenient, politicians and state agencies make use of maracatu’s popularity with the working class and appropriate its symbols – governor Eduardo Campos (a presidential hopeful until his untimely death in August) was even flanked by an honor guard of caboclos de lança during the inauguration of his second term in 2010. For the maracatuzeiros, maracatu is only maracatu if it goes until the sun comes up. If not, it becomes “folklore,” a word used in the region to denominate any type of artificial presentation, like a show for tourists, being filmed for television, and so on. The importance of playing until sunrise is perhaps easier to understand if you think if it as something mystical and religious. It seems simple, but it’s not. The entire night is needed, but the point is not the quantity of time, but instead the possibility of the suspension of time. To make time stop: the people who perform the heaviest manual labor seem to only know how to relax by pushing their body to the limit in dance, in song, in the mental juggling-act of rhyme. At the public hearing held February 14 in Recife, maracatuzeiros and their allies presented their grievances to officials from the Public Prosecutor’s Office and the Military Police, who predictably denied any discrimination or persecution. The officials argued that their interests were solely about public safety and order (which seemingly manifests as a bizarre fixation on salting the earth with sanitary portable toilets). They dissimulated and deflected accountability in accordance with their own tradition – that of bureaucracy. Recording artist Maciel Salustiano, whose father Manoel Salustiano founded the Maracatu Association of Pernambuco in the 1980s, emphasized that maracatu is not just about pretty costumes at carnival, but a belief system and tradition. His brother Manoelzinho, current president of the Association, pointed out that many maracatuzeiros would feel coerced into signing documents foisted on them by the police. During the course of the hearing, it became evident that Maracatu Cambinda Brasileira had been asked to sign an authorization document that differed drastically from the usual format to which they were accustomed. The new form, signed without the maracatu being aware of its full contents and ramifications, stipulated that they were asking authorization for an event in excess of 3,000 people – a number filled in by the attending police officer – and would need to terminate at 2 a.m. In actuality the event had an estimated 500 attendees, which was relatively large by the standards of maracatu. Author and journalist Dr. Maria Alice Amorim, coordinator of a project to gain protected status for maracatu as immaterial patrimony with the Institute of Historical and Artistic National Patrimony (or IPHAN), talked about the need for dialogue and the potential consequences of the misapplication of security laws for cultura popular in the state. Siba emphasized, “Yes, maracatu events need and want some police presence. But maracatu should not be treated as a police matter. Maracatu is a tool of civilization; it is a positive force in society.” Law professor Liana Cirne Lins added to these observations that there was no legal basis for classifying these gatherings in the same category as large events. She argued that what was happening was clearly discriminatory, racist, and illegal: nobody sees the police shutting down large gatherings held by the wealthy, and the police actions are consistent with the legacy of unequal treatment left in place by an aristocratic slave-holding regime. No deaths have been attributed to any maracatu event, yet the authorities’ constant reference to the “Pact For Life” program serves as justification for their arbitrary and erroneous application of the law. If cultural policy fails to address the current stifling of the core practices of maracatu, “folklore” is all that will be left. Siba in his letter went on to acknowledge the artistic debt he holds to the regional singers from whom he learned in a long process of apprenticeship – poets like Barachinha, Dedinha, João Paulo, and Zé Galdino – “who are giants there, but unknown even in Recife, the land of Mangue Bit,” referring to the movement of the 1990s that contributed to an efflorescence of creative reinvention in music, cinema, and the plastic arts. Maracatu de baque solto is finally receiving broader respect and recognition, becoming fashionable with a portion of the artistically-inclined in cities as far away as São Paulo or Paris, with some groups traveling to festivals in Dakar and New Orleans. Yet Pernambuco, and perhaps Brazil more generally, is in the duplicitous position of celebrating the diversity and social inclusion of its artistic heritage while continuing to persecute and exclude many of the people who create it. This may be changing in the near future. The proposal to include maracatu and related forms of artistic expression in Pernambuco (such as caboclinhos, cavalo marinho, and the more urban maracatu nação) on IPHAN’s register of immaterial patrimony would guarantee maracatu constitutional protection in accordance with the UNESCO charter. In the months since February the town of Nazaré da Mata, which has the highest concentration of rural maracatu groups, passed an ordinance permitting their events to continue uninterrupted. But complaints about police shutdowns were received by 32 municipalities in Pernambuco; the struggle will not be over until all maracatu groups can practice their tradition without fear of police repression. In maracatu they dance a rhythm that only exists there. There are no standardized moves. Everyone dances in their own way: in the style of maracatu, but nobody dances the same. The “manobra,” the choreographed maneuver that opens and closes the celebration, is an intricate movement that involves dancers, musicians, and poets in a mobile constellation that seems like an image of the chaos that generated the universe, but which moves with the grace and beauty of the best of all possible future worlds, for those who know how to see it. This entry was posted in Essays and tagged ensaios, sambadas, segurança pública. Bookmark the permalink.